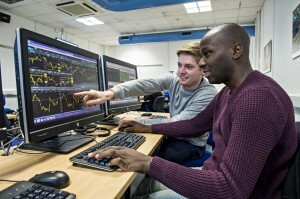 The annual OSTC Trading Challenge provides a unique opportunity for our finance students to trade, in a virtual environment, through futures derivatives in a number of products including; commodities, equities and fixed income. The prices, the news, the winning and the losing are real; the positions, profits and losses are imaginary. The Trading Challenge teaches students to make decisions under pressure, take calculated risks and experience the excitement of the trading floor. Each student has unlimited funds to invest during three months of virtual trading. The student with the highest portfolio at the closing bell wins a trophy. As players are bombarded with information from live news feeds, the pressure to build a winning portfolio creates a fast-moving and exciting event. The event is organised by Sam Baker, Managing Director of the Brighton branch of OSTC, a financial trading company which operates a specialised, fast and secure trading environment in financial markets around the world. Sam started working for the company after graduating from Brighton Business School in 2003. Once again, this year’s competition takes place in our Trading Room. Brighton Business School is one of just a handful of UK universities that has a fully equipped real-time trading room, with up-to-the-minute data from Reuters it helps recreate the pressure of a trading floor. OSTC’s 2017 challenge runs until 10 March and the university’s team are off to a good start. All wannabe traders are encouraged to get involved by joining the university’s Investment and Trading Society. See our website for more details about our undergraduate and postgraduate Finance and Investment courses. Tagged Competition, finance and investment, trading, Undergraduate. Bookmark the permalink.